"Thekkady Tour package 2018- Book Thekkady Kerala India Tour"
The drive to Thekkady from Cochin is of about 185 km that requires around 4 to 5 hours of travel. 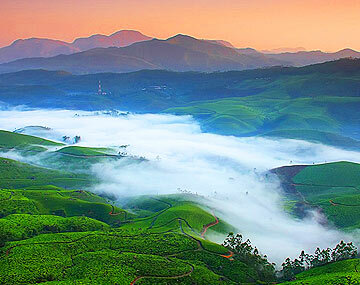 The state of Kerala is known for its scenic beauty and picturesque landscape. This is the reason why the road trip between any cities of Kerala is always fascinating and enticing. On your arrival to Thekkady by afternoon you will be checked into hotel. After that you will be taken for sightseeing in Thekkady, Kerala. Places like Spring Valley Mountain, Pandikuzhi, Chellarkovil, Grampi, Panchalimedu, Kumily and Vamdiperiyar are places loaded with exquisite natural beauty and greenery and are the souls of Thekkady. Enjoy your overnight stay at comfy hotel in Thekkady. After the breakfast, we will dedicate the next day at Periyar Wildlife Sanctuary. The first thing you can go for on your Periyar holidays, Theklkady is the Jungle Safari to explore the wild life, animals and plants at the closest. The trip to the sanctuary is most tempting of all. After that you will be visiting Mullaperiyar Dam built across the Periyar river. By evening you can go for boat ride at Periyar Lake, Thekkady or if you wish you can go for Bamboo rafting or natural walk and elephant ride. You can make your trip more memorable by enjoying bon fire in the night. Have an overnight stay in Thekkady near the natural and wild aura of Periyar. Have breakfast and check out from the hotel as after experiencing the wilderness and glory of Thekkady, Kerala, India, we will go for experiencing the beauty of beaches and backwaters of Cochin. Our last destination of Thekkady sightseeing packages would be the city of Cochin. Cochin has plenty of places to satisfy your thirst for nature as well as your quench for historical and cultural monuments. You can spend your day by visiting places like Fort Cochin, Navy museum, St. Francis Church, Chinese fishing nets, Santa Cruz Basilica, Mattanchery palace, Jewish synagogue, Marine drive and Tripunitura Hill palace. If you have time, then you can also go for shopping at Cochin to bough some memento for yourself and your loved ones. After that our representatives will drop you at airport or railway station or bus stop. If you have a gig for nature and wildlife then Thekkady is a paradise for you. Its unspoilt forest, exotic wildlife and scenic vistas will make your weekend worth remembering. Our Thekkady Kerala tourism will take you for Thekkady sightseeing tour and visit to Periyar Wildlife Sanctuary.This tour package of 2 nights and 3 days will take you into the lap of nature surrounded by dense forests, wildlife and steep valleys. Thekkady sightseeing packages include the visit to local areas of Thekkady and access to Jungle Safari at Periyar Wildlife Sanctuary. Our Thekkady tour packages include everything for your perfect weekend. Our representatives take care of everything from stay at hotel to cabs to local areas and from eateries to sight-seeing. Our representatives are well versed with the tourist areas and road maps so that nothing is left while you are on your tour to Thekkady, Kerala, India.